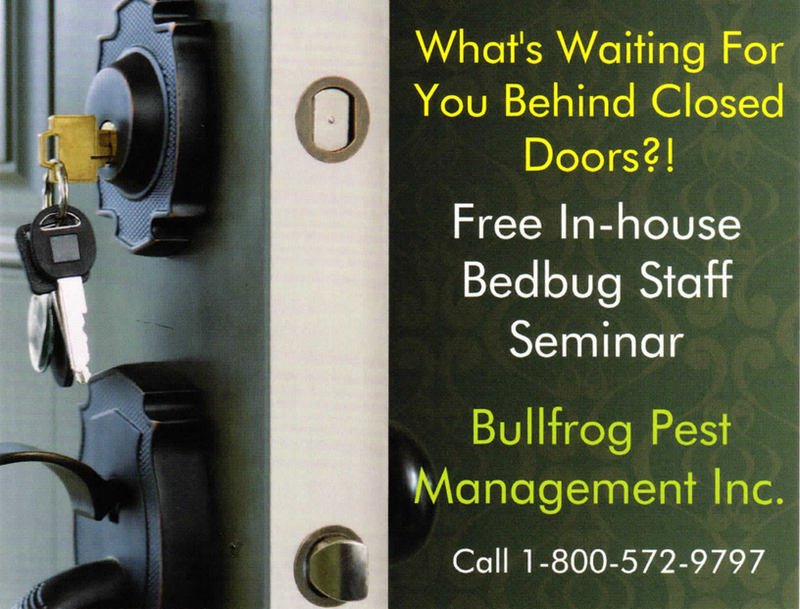 Invite your staff to attend a FREE In-house BEDBUG seminar. Set up a time at your business, at your convenience to train your staff how to spot bedbugs, proper protocol to follow and steps to prevent bedbug infestations. Reduce the amount of time that your rooms are off-line. Call today for this no-obligation seminar. Bullfrog Pest Management Inc., is a comprehensive, family owned pest control company offering quality proactive, progressive and safe solutions to pest problems through Integrated Pest Management (IPM) and Green Pest Management (GPM). Since 1978, the company has been a hardworking and trusted partner to its commercial, residential and institutional clients. 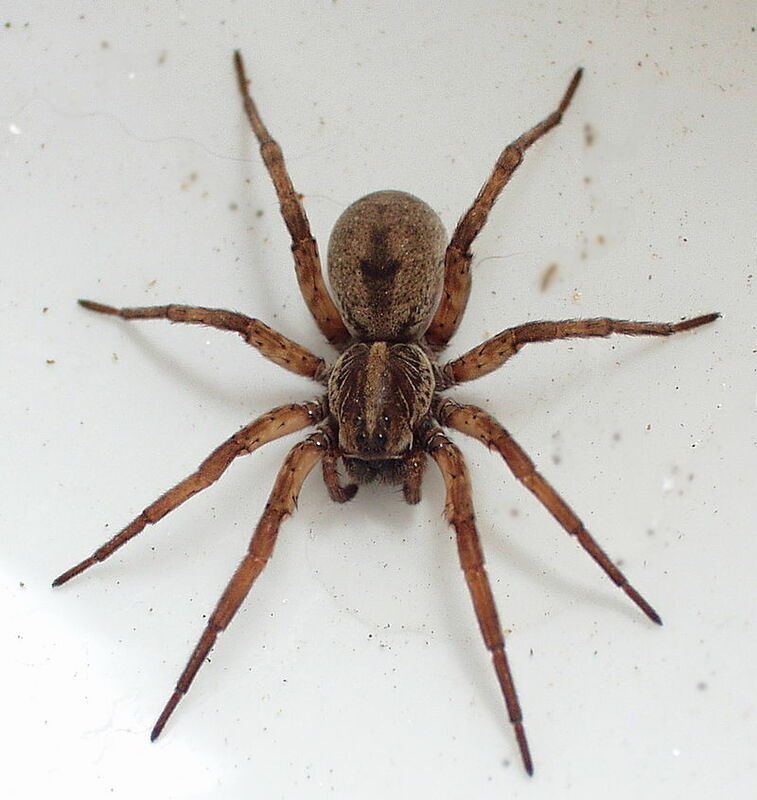 Our highly trained technicians inspect, advise, and design a tailored pest management program that combats pest problems and reduces harmful pesticide use where our clients live, work, and play. Committed to safe practices, in 2008, Bullfrog Pest Management became one of the first companies in the nation to become Green Shield Certified; proving that ‘Bullfrog Green’ is a verifiable Advanced IPM program. Please browse our site and learn how we may be of service to you and/or your organization. 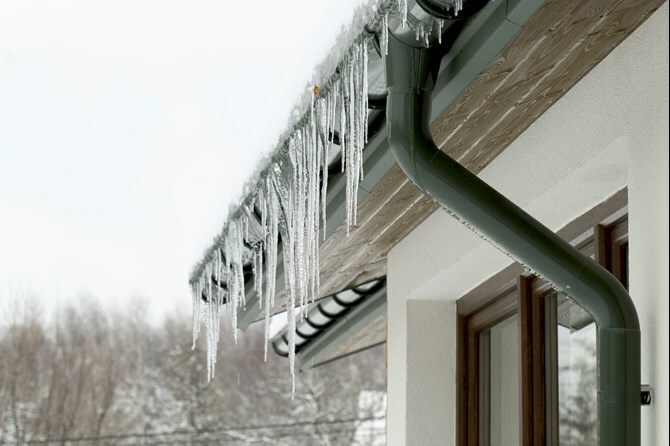 We service Long Island, New York City, Manhattan, Queens, Bronx, Brooklyn, Syosset, Nassau County and Suffolk County. 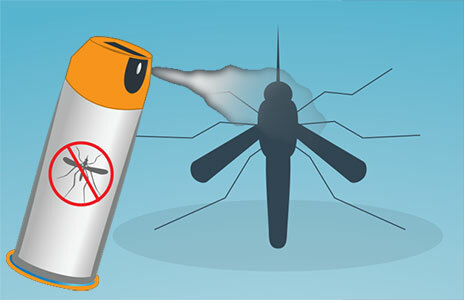 Bullfrog Pest Management, Inc services commercial, healthcare, institutional and residential and includes extermination of termites, bed bugs, roaches, carpenter ants, rodents, fruit flies, crickets, birds, etc. We are family owned and operated and we service Long Island, New York City, Manhattan, Queens, Bronx, Brooklyn Syosset, Nassau County, and Suffolk County. 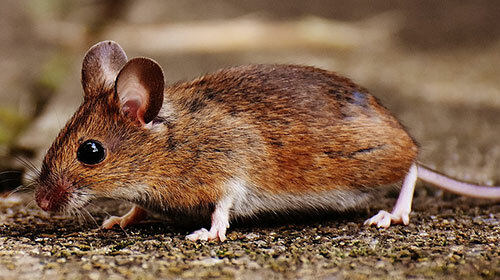 Learn More about our pest control services. 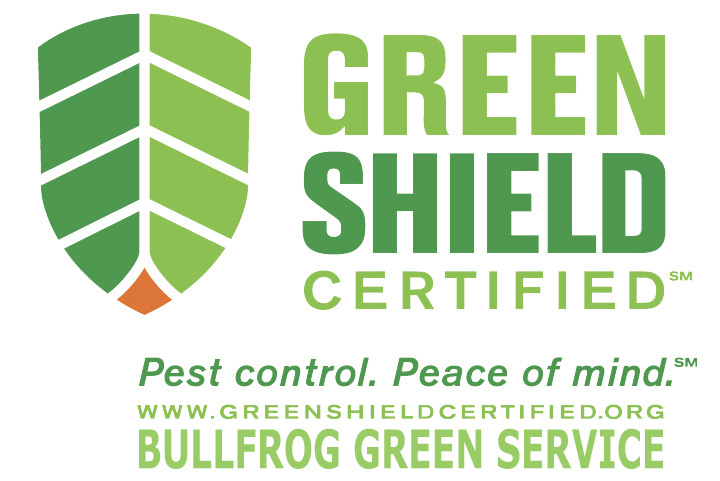 Bullfrog Pest Management, Inc. offers Bullfrog Green, a Green Shield Certified service. Bullfrog Pest Management, Inc. offers Termite and Residential Proactive green pest management solutions. Bullfrog Pest Management, Inc. provides Advanced IPM green pro-active pest control in institutional, commercial, hospitality, restaurant, healthcare, country clubs and more. First year FREE service With the installation of Advance Termite Bait System included in a general pest control contract. Check out our bed bug page! Learn more about pests with bullfrog's wisdom and insightful articles. Get all out ribbits, tweets and tips in your feed. Follow us on twitter. Updates, events and specials on your Facebook news feed. Follow us. Bullfrog Pest Management Inc., is a family owned and operated pest control company servicing commercial, institutional, health and human service facilities and homes on Long Island and the NYC metropolitan area since 1978. About Us – Bullfrog Pest Managment, Inc.
© Copyright 2018. 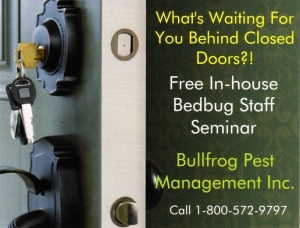 Bullfrog Pest Management, Inc.